Developer SP Setia Bhd plans to launch its RM6 billion "green" mixed development opposite Mid Valley Megamall in Kuala Lumpur by July next year, its chief said. The project, to be known as KL Eco City, will be developed in three phases over at least 10 years. It will be a joint venture with Kuala Lumpur City Hall (DBKL), which owns the 9.7ha leasehold land in the Kampung Haji Abdullah Hukum area. SP Setia first announced its intention to develop the land almost a decade ago, but had faced problems with squatters in the area, among other things. "That project has been approved. We hope to launch it by the third quarter of our 2010 financial year ... and start work on it even earlier if we can," president and chief executive officer Tan Sri Liew Kee Sin told reporters at the company's results briefing in Shah Alam, Selangor, yesterday. DBKL will be its partner on a profit-sharing basis, taking 20 per cent of the project's net profits, he said. SP Setia will develop office, commercial and retail space in the first phase; condominiums in the second; and signature offices in the third. Liew ruled out building another mall. 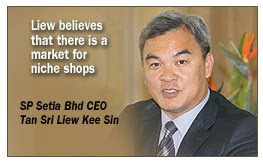 "We'd like (our development) to complement Mid Valley. We think there's a market for niche shops," he said. KL Eco City is expected to start contributing to the developer's bottom line in its financial year ending October 30 2011. Liew acknowledged that there would first have to be a lot of work done to ease traffic congestion in that area. SP Setia will spend RM250 million of its own funds over this financial year and the next to improve the infrastructure there. The KTM Komuter station in that area will have to be relocated, he said. Liew also said that KL Eco City would be the first total integrated development to apply for the Green Building Index "gold standard". Property analyst Ong Chee Ting of Maybank Investment Bank said the project would be feasible if well planned. "It's a prime area and the developer has a strong brand name. So I don't see why it should fail," he told Business Times. PETALING JAYA: SP Setia Bhd’s net profit fell 25% to RM56.9mil in the final quarter ended Oct 31 without the one-time gain that boosted its income in the previous corresponding period. The group’s latest quarterly performance was also affected by slower sales. The drop in profit dragged down the group’s full-year (FY09) earnings to RM171mil, or 16.8 sen per share, compared with RM213mil, or 21 sen per share, in the previous year. Revenue slipped 4.8% to RM1.4bil from RM1.47bil in FY08. SP Setia will pay a final dividend of 9 sen per share, bringing the total payout for FY09 to 14 sen compared with 17 sen in FY08. SP Setia, the most valuable property stock on Bursa Malaysia, said its earnings would be back on the growth track in FY10. In notes accompanying the group’s latest set of results, SP Setia said market forecast of 10% to 15% growth in earnings for FY10 was “in line with internal management targets”. Affin Research analyst Loong Kok Wen, who attended a briefing by SP Setia yesterday, said the group’s full-year performance was well within market expectation. “The management also indicated that its focus next year will be on margins,’’ she said. To do this, SP Setia intends to improve overall yields by targeting to grow its gross development value and create higher values at all its projects. This includes launching the RM6bil Kuala Lumpur Eco City by October next year. Other plans include the disposal of “certain non-core” assets and deployment of the group’s strong balance sheet to acquire new landbank. SP Setia said it achieved “a new benchmark” in terms of total group property sales that reached RM1.65bil in FY09. This was 18% higher than the previous high achieved in FY08 and 50% better than its own target set for the year. Malaysia's biggest property developer SP Setia Bhd said net profit for the full year to October 31 2009 fell by a fifth to RM171.2 million, despite hitting record sales. The company is however confident of returning to net profit growth this fiscal year, helped by new launches and its new "Best of the Best" campaign to boost home sales. President and chief executive officer Tan Sri Liew Kee Sin expects sales this year to be better than the record RM1.65 billion it achieved in the year just ended. The new campaign, launched in October, is proving to be popular and has already helped it pull in RM300 million in November, its best monthly sales ever, he said. Net profit had dropped in the last fiscal year due to the company having to bear costs from its previous 5/95 home loan campaign, as well as higher constructions costs. The company is actively looking to buy more landbank in the Klang Valley, Penang and Johor, Liew said. "I think the Malaysian market is very strong, so we'll focus strongly on Malaysia," he said, adding that it would expand in a bigger way in China and Vietnam in five years' time. It may sell its two Tesco hypermarkets in Setia Alam (Shah Alam) and Johor this fiscal year to obtain funds for land purchases, he said. Analyst Ong Chee Ting of Maybank Investment Bank raised SP Setia's stock to "buy" from "sell" yesterday on the back of its improving prospects and inexpensive valuation. The company still has unbilled sales of RM1.5 billion, he noted. SP Setia's revenue for the year just ended fell by 4.3 per cent to RM1.41 billion. Net profit for the fourth quarter fell by 25 per cent to RM56.8 million, while revenue slid 36 per cent to RM293.4 million. Naza TTDI Sdn Bhd, property arm of the Naza group, will build an iconic tower on a 25ha site near the proposed Matrade Centre in Kuala Lumpur, but is yet to finalise the height. Group managing director SM Faliq SM Nasimuddin suggested that the building could even be higher than 100 storeys. However, much will depend on the amount of investments it can secure. Buildings of such height could cost up to 50 per cent more than an average high-rise. SM Faliq was confirming a recent New Straits Times report that it was one of three developments expected to house iconic structures in Kuala Lumpur. The other developments slotted for the iconic structures are believed to be Permodalan Nasional Bhd's (PNB) 7.2ha project surrounding Stadium Merdeka and Pelaburan Hartanah Bumiputera Bhd's (PHBB) site at Dataran Perdana. Currently, the country's highest building is the 88-storey Petronas Twin Towers. "The master plan (for the 25ha area) is yet to be finalised. It should be completed by early next year," SM Faliq said after the launch of Naza Talyya's newly refurbished hotels in Kuala Lumpur yesterday. "No matter what the height, the structure will be a green building," he added. The company is expected to hold a press conference on its developments sometime next week. Four international firms are working on the master plan for the 25ha development near Jalan Kuching, which includes the RM628 million Matrade Centre, deemed to be the largest exhibition and convention centre in in the country. PNB did not respond to queries sent to its communications team. However, a source said PNB had managed to secure the approval of Prime Minister Datuk Seri Najib Razak for its proposed iconic development. Sources said the third site, to be developed by PHBB, was expected to house a 50-storey building although a much taller one had been planned initially. Meanwhile, news of the proposed iconic structures have triggered a backlash from some property players in the country. Property tycoon Datuk Tan Chin Nam said building 100-storey office structures could cause a glut in office space and leaving the buildings empty subsequently would mean non-income producing space. "Why do we need to go for high-rise when we have land? The money could be put to better use," said Tan, patriarch of the Tan family which controls IGB Corp Bhd. He suggested that a forum or discussion be held before the developers went ahead with such large-scale projects. The Naza group plans to invest some RM780 million to open five new hotels in Kuala Lumpur over the next two to six years. It is looking at opening three three-star category hotels under the Naza Talyya name in Kuala Lumpur's Golden Triangle. The remaining two will be five-star properties; one scheduled for opening at its Platinum Park development next to the Petronas Twin Towers and another near the proposed Matrade Centre on Jalan Kuching. Naza Hotel Management Sdn Bhd director Nur Nadia SM Nasimuddin said that investment in each of the three-star properties could be between RM50 million and RM60 million. She was speaking to reporters after the launch of Naza Talyya's newly-refurbished hotels in Kuala Lumpur yesterday. Naza TTDI Sdn Bhd group managing director SM Faliq SM Nasimuddin said the hotel to support the proposed exhibition centre could cost some RM300million. "It will be ready at the same time as the Matrade Centre in 2014," he told Business Times. As for the hotel building at Platinum Park, he estimates that it too could cost RM300 million for a 350-room hotel. It is looking for a foreign operator to manage this hotel, which is slated for completion in 2014/2015. It is open to foreign investors pumping money into the project. The Naza group now operates three hotels in Penang, Johor and Malacca under its Naza Talyya brand name. The name "Talyya" means bloom or blooming in Arabic. IREKA Corporation Bhd has proposed to acquire a piece of freehold land measuring 43,559 square feet located in Jalan Kia Peng, Kuala Lumpur, for RM87.12 million. Subject to planning and development approvals, the site will consist of single-towered high-end serviced residences with an estimated gross development value of RM272 million. "We are pleased to acquire this prime site for development, located in the heart of Kuala Lumpur City Centre (KLCC). The KLCC area will always be the country's most exclusive address and an international real estate investment destination," Ireka chairman Abdullah Yusof said in a statement today. Ireka has also entered into a memorandum of understanding with Aseana Properties Limited to co-develop the land on a 30:70 basis. HONG KONG: China’s property prices climbed last month at the fastest pace since July 2008, adding to concern that record lending may create asset bubbles in the world’s fastest growing major economy. Residential and commercial real-estate prices in 70 major cities rose 5.7% from a year earlier, compared with a 3.9% increase in October, the National Bureau of Statistics said on its website yesterday. Prices of newly built homes rose 6.2% in November, accelerating from 4% the previous month, and second-hand housing prices rose 5.5%. China yesterday issued policies to curb surging property sales amid record prices and after a pledge by Premier Wen Jiabao to support affordable housing. The government would curb “speculative” purchases to cool the residential housing market, the official Xinhua News Agency reported yesterday, citing National Development and Reform Commission chairman Zhang Ping. The country’s banking regulator planned to slow new lending to between seven trillion (US$1 trillion) and eight trillion yuan next year, versus 8.9 trillion yuan in the first 10 months of 2009, a person familiar with the matter said yesterday. The measures may not be enough to curb further price gains next year, as supply growth was not keeping up with demand, analyst Wang Ren said. “Inflationary concerns and ample liquidity will keep boosting home prices, especially when supply isn’t enough. Prices are likely to continue rising in the first half of next year,” a Hong Kong-based analyst at CCB International Co said before the data were announced. A drop in new lending next year may not cut liquidity significantly given the record loans made in 2009, he added. Shanghai’s index of property stocks was 0.5% lower at the midday break, after more than doubling this year, making the industry the second-best performer. The Shanghai Composite Index was little changed at the break. Property sales by value jumped 86.8% to 3.6 trillion yuan in the first 11 months of the year. By floor area, sales rose 53% to 752 million sq m.
Investment in property development rose 17.8% in the first 11 months of 2009 from a year earlier to 3.13 trillion yuan, the statistics bureau said. That was an acceleration from the revised 16.6% for the 10 months through October and 9.9% in the six months to June. MAGNA Prima Bhd's wholly-owned unit Twinicon (M) Sdn Bhd has signed a deal with Santari Sdn Bhd to buy a 5.506-acre freehold land in Bandar Bukit Jalil, Kuala Lumpur for RM10.7 milllion. The property will be used for the relocation of Lai Meng Primary School and Lai Meng Kindergarten currently located along Jalan Ampang, Kuala Lumpur. The proposed acquisition is expected to be completed in the first quarter of 2010. This purchase is part of Twinicon's plan to buy Lai Meng Girls' School Association's land along Jalan Ampang for RM148.2 million.